It can be tedious to try to figure-out how long your hike will take and when you'll be where. You really can't predict exactly how your hike will go. Things come up. Weather changes. You might want to speed-up or slow-down to match the schedule of another hiker. You can try, though. Using the planner, you can get a rough estimate of your itinerary. If you've got Google Earth installed on your computer or smartphone, then all you need to do is download the map data (KML) and open it up in Google Earth. 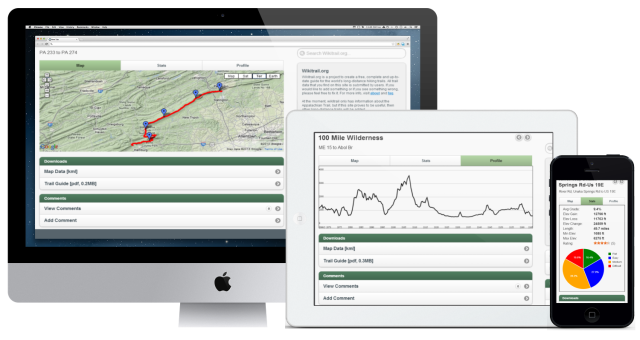 Try it out using data from the final section of the Appalachian Trail. You've contributed to wikitrail.org, so why would we hog your work. All site content is licensed under Creative Commons Attribution-ShareAlike. So, you're free to take the data and do as you wish - as long as you link back to wikitrail.org. The Appalachian Trail starts at Springer Mountain in Georgia and finishes at Mount Katahdin in Maine. It passes through the states of Georgia, North Carolina, Tennessee, Virginia, West Virginia, Maryland, Pennsylvania, New Jersey, New York, Connecticut, Massachusetts, Vermont, New Hampshire, and Maine. The majority of the trail is in the wilderness, although some portions traverse towns, roads and cross rivers.